Welcome Spring deliciously with this decadent selection of chocolate favorites. 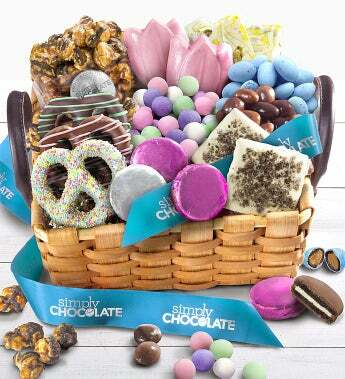 This sweet basket is brimming with Lemon Pistachio bark, chocolate bridge mix, pink chocolate tulips, chocolate covered pretzels and OREO cookies, caramel robin eggs, cookies & creme white chocolate grahams and more. Beautifully presented in a wood slat basket tied with Simply Chocolate ribbon.